My brother sent me a bag of these - he said they’re called Jelly Melons. Wikipedia yielded a bit more information (Cucumis metuliferus) and I’m intrigued. I’ve not yet cut into one, but that’s next on the agenda. 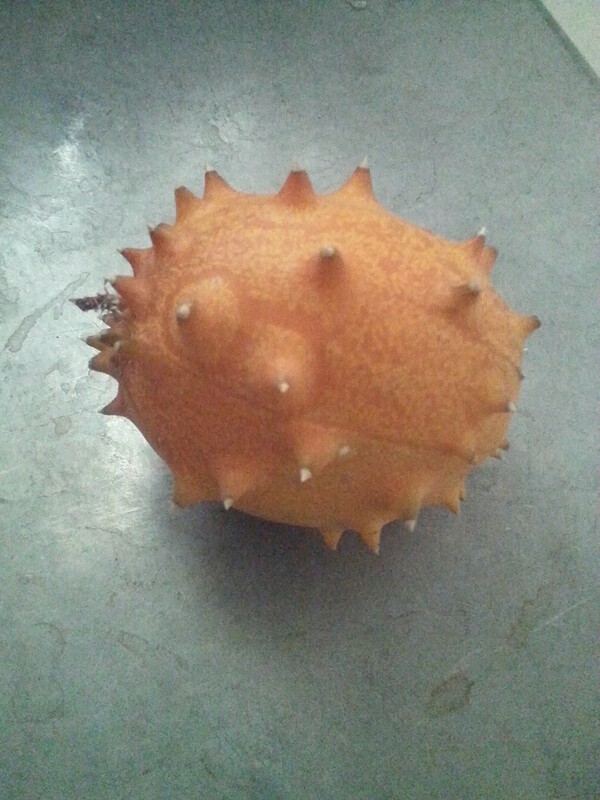 Was curious if any of you have eaten or cooked these rather intriguing fruits and have any ideas of what I should do with the unexpected bounty. … why are you asking us? The fruit looks like a hedgehog. You look like a hedgehog. The fruit looks like a hedgehog. You look like a hedgehog. I have a sneaking suspicion that might well be why my brother sent them to me - he knows me far too well! Maybe hide behind shrubs and hurl them at unsuspecting folks you don’t like? Those look like they’d leave a mark. Apparently, according to the all-knowing Wikipedia, in the southeastern US they’re called “blowfish fruit.” Yes, they do remind me of one. That site has a few suggestions for how to prepare them, if you haven’t found it already. I’ll keep an eye out myself from now on. They sound good. I tried it once a few years back. It was pretty bland. No idea if that was typical or just that particular piece of fruit. 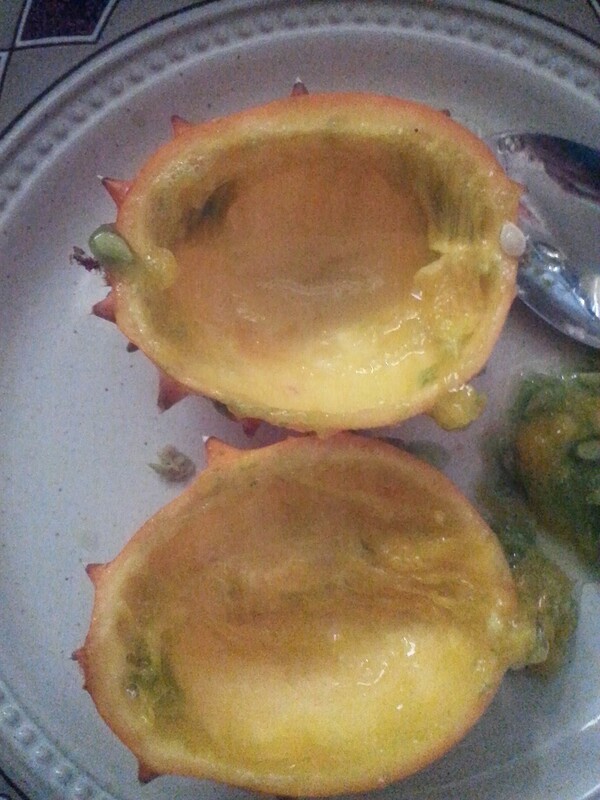 I cut one open and ate it last night (can’t upload photos from my phone, so will do so when I get to my laptop). 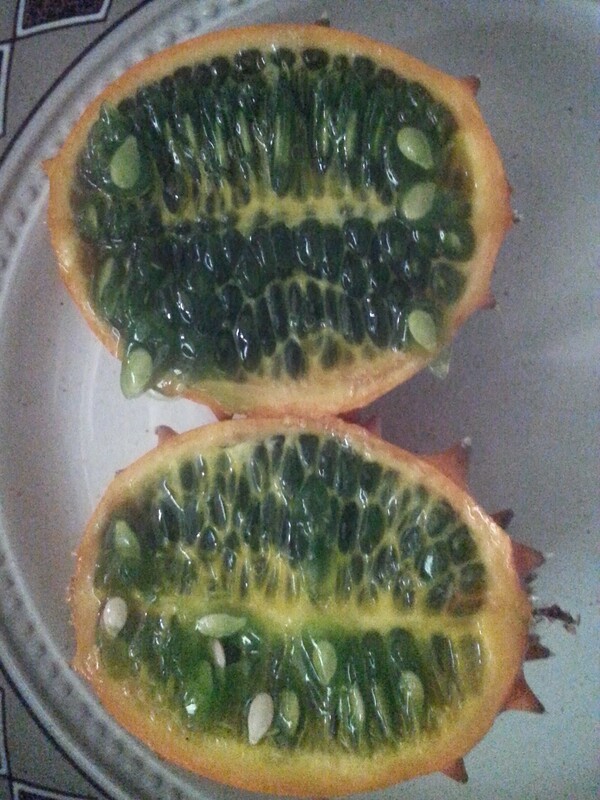 Interior was a deep green - beautiful contrast with the orange skin - and filled with seeds. Scooped out a spoonful. The scooping broke the membranes around some of the seeds, so I was looking at a watery, gelatinous mass, and seeds. Scent? I’m not sure. Light and clean more than anything. Taste? First was a bit of the juice. Definitely tartish, but not horribly so (I don’t like tart), light, maybe almost kiwi-tart. I didn’t taste cucumber, but it could have been there. Not bland, but not showy. Next was the rest of the spoonful with the seeds. The membranes are very…slimy? I know that’s not a typically appealing texture, but I didn’t find it off-putting. Think of a ball of tapioca. Biting down caused the juice to burst out and then there was the seed. Reminded me a bit of a pomegranate seed in consistency / crunchiness. A bit fibrous, almost no flavor. There was a high seed to juice ratio, maybe 40%? I wanted more of the juice and less of the seed. The flavor was…haunting. Not quite tangible. I’ve been thinking about it all night, wanting to try another one. Thank you for the link! I hadn’t come across this. Off to read. The Jelly Melon, cut in half. Beautiful color! 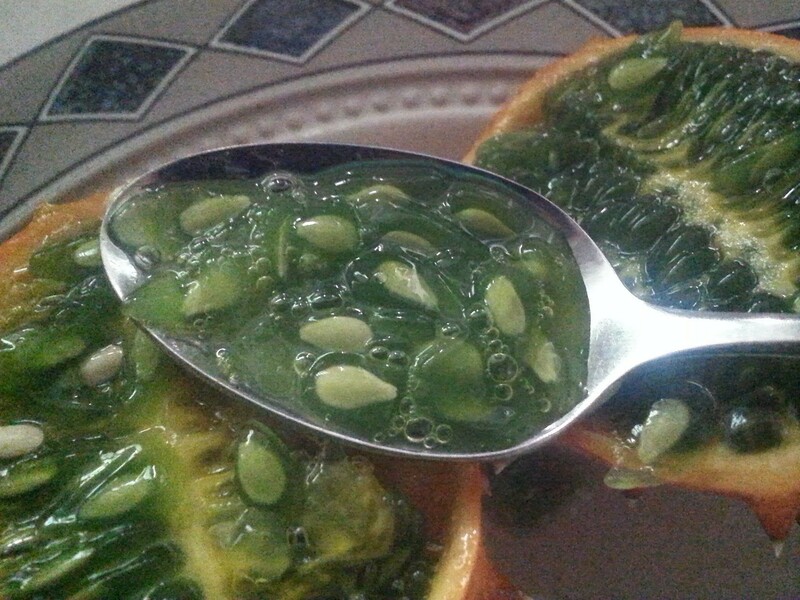 Spoonful of Jelly Melon, brimming with seeds. Interesting! The dissected shot looks a bit like the underside of a beetle. Glad they’re tastier than they look. Much tastier than a beetle, I imagine (though having never knowingly consumed a beetle, I might be wrong). I’ve eaten two more of these today. I am frustrated and tantalized by the flavor. It’s triggering an association, but that association is just beyond my grasp. I’ve been reading other people’s descriptions of the taste and they come close, but aren’t spot on. Best I can describe is it’s a taste memory that I can’t recall. Very intriguing. I’m going to assume you are not wrong, thus there is no impetus for personal experimentation. I had this thing in Chile. I remember it tasted specifically like nothing. It does look cool, however.